Electric Light and Power Department. For full description see following page. The insulator supports of an overhead line are the most vital points of importance to the insulator resistance of the entire line and those that are the most advanced in electric light and power work have learned from experience the economy of carefully insulating the line to prevent the leakage of current. The Fluid Insulators are especially designed to prevent surface leakage, and to give an insulator many hundred times higher than that obtained from the ordinary forms of glass insulators now in use. An insulating fluid, which is not sufficiently dense to support even a film of dust or moisture, is placed in a recess formed in the glass, and well protected from the weather. In this way a fluid surface, which is always clean and highly insulating, even in the dampest weather, is interposed between "line" and "earth." It can be readily observed that, although the first outlay for these insulators may be greater than that for ordinary glass insulators, the subsequent saving in running expenses and the avoidance of trouble will more than repay first expenses within a very short time. In power transmission, where it is desired to transmit heavy currents of high electro-motive force, the use of Fluid Insulators is an absolute necessity to success. In connection with this we would call attention to Prof. Badt's Electric Transmission Hand-book, and particularly to the test of Prof. Weber mentioned on page 51. The "Insulation Fluid" will not freeze, evaporate, nor creep like paraffine or mineral oils, and will last three or four years even in a hot climate. 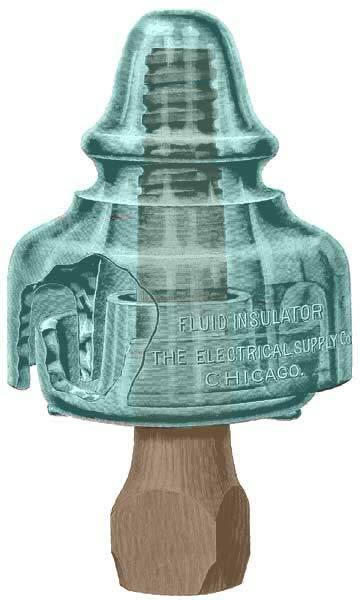 It is, therefore, advisable to use the Fluid intended for the insulator and not cheap substitutes. 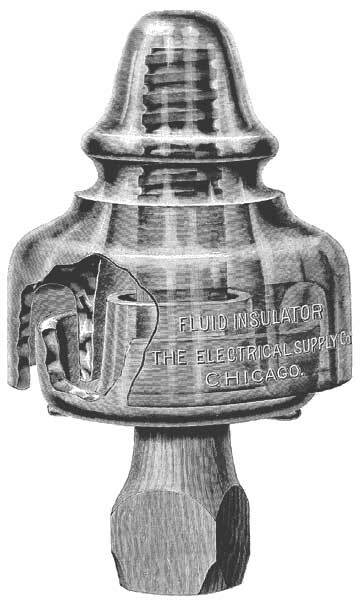 A conception of the value of Fluid Insulators may be gathered from the fact that at the present time they are in use all over the world by various governments, telegraph, telephone, and electric light and power companies, but nevertheless, although foreign companies have been using them for over twelve years, and their insulator properties have become a matter of record, they have not heretofore been extensively adopted in the United States, principally on account of the less care used in these matters by the people in this country and their advance in price over those commonly in use. In placing them before the electrical public we appeal to the intelligence of the purchaser rather than to his preconceived ideas of economy, and feel confident that if these insulators are once adopted their record will justify our claims for their excellence and our confidence in the intelligence of the purchaser.